Is it the waters of India? How else do we keep producing all-time-great batsmen with such regularity. Sunil Gavaskar retired in 1987, paving the way for another great—Sachin Tendulkar—in 1989. As Tendulkar was winding up his career, Virat Kohli took up the mantle to be the great of this generation. And yes, these are true batting greats acknowledged by the entire cricketing world, and not just us Indians. So this is not like mera Bharat mahan. Sunil Gavaskar was my icon; more than my father, it was because of him that I wanted to become a cricketer. In fact, I gave up leg-spin bowling that I used to bowl decently, lest I become an all rounder and be nothing like Sunil Gavaskar. Gavaskar played at a time when India went about playing international cricket with an inferiority complex. These were pre-helmet days, so fast bowling and the West Indians with their four fast men were the challenges that you had to take on as an Indian player. Sunil Gavaskar passed this test by fire with flying colours and made us all proud. India loved him for the courage he showed as an Indian on the world stage. This era was about defensive batting and Gavaskar was a model of the perfect defensive technique, we up-and-coming batsmen marvelled at how he left the ball alone as it passed his chin. West Indians bowled at least three bouncers per over; they called it “chin music”. Tendulkar took Indian batting to the next level. He was the first Indian batsman who dominated foreign attacks in their homes like Viv Richards did in the Gavaskar era. Tendulkar was unique in the way that it was the first time fans saw an Indian batsman hit good balls for boundaries. This was the phase when India had earned the reputation as a team that were tigers at home and lambs overseas (they still carry that tag). Tendulkar was the only guy who looked at home away from home. If the West Indians respected and loved Gavaskar, Tendulkar earned the adulation of the Australians, the best team in his time. If Gavaskar willed himself to batting greatness, Tendulkar was a child prodigy who may have found batting at the international level easier than Gavaskar did. But his confidence never became arrogance. This was his special quality. Now, the baton has been passed on to Virat Kohli. If Tendulkar got hundreds, this guy gets match-winning ones. When he leaves the scene, he will leave behind the legacy of physical fitness and mental toughness. His batting is as much about him running singles and twos with child-like enthusiasm, as it is about the signature cover drives. This batting great keeps putting his body—that he has developed to bear exceptional rigours—on the line day in, day out. The hotter the conditions, the more physical his innings become. His hundreds are generally studded with only ten boundaries. It is not that he cannot hit big shots, but he is a believer of risk-free run accumulation. In England we saw the mental toughness, too. 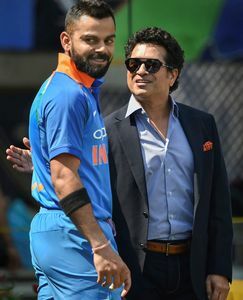 Unlike Tendulkar, who had no batting flaw, Virat clearly has a chink in his batting armour when, in helpful conditions, bowlers target his off stump. This is where his great character kicks in. When he got his first hundred in the recent series against England, he left almost seven overs of James Anderson alone. This from a guy who is a game changer in T20 cricket. As I said, it has to be the waters of India.